One of the fundamental questions that we humans often ask ourselves is – what makes us happy? Apart from harmonious relationships, one of the strongest keys to happiness is generosity or giving to philanthropy. As mentioned earlier, my focus on philanthropy continues with this post on the topic for the month of June. As regular readers might remember, my fascination with research conducted towards philanthropy (that too with a gender lens) started with my conversation with Debra Mesch about their latest report – Women Give 2018. During the discussion, she did mention that this annual report had quite a bit of value in the previous versions as well. I took her word for it, leading to a short post about the main findings from Women Give 2017. 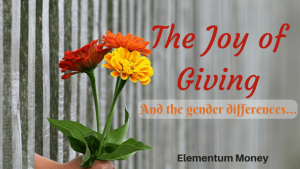 While Women Give 2018 was more concerned about transmitting the value of generosity across generations, Women Give 2017 looks more at the “warm glow” that giving leaves us with and is often a propeller or big reason to have the habit in the first place. In 2001, the Lilly Family School of Philanthropy developed a module on giving and volunteering. There was a whole set of questions called “Philanthropy Panel Study.” They were able to attach that module to a much larger data set: The Panel Study of Income Dynamics (PSID). PSID is nationally-representative data out of the University of Michigan, which was started in 1968 by Lyndon Johnson. Today, it is a rich source set of social sciences data covering 10,000 households where the members and their future generations are tracked through years. This huge set of quantitative data is used for most of the Women Give research series. For the analyses on happiness or joy as a result of giving, the respondents’ self-admission of giving a number on a scale of 1 to 5 as to how satisfied were they with their life was taken as a measure. 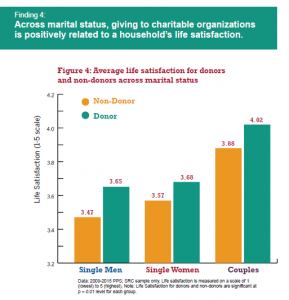 The research compared the satisfaction levels as reported by donors and non-donors in various social and demographic cuts like single men, single women, couples and the result was unanimous. Every group experiences a higher satisfaction in life if they donate as compared to being non-donors. The research took into account the percentage of annual income donated. This number has been consistent at 2% of the annual income in the US for the past 2 decades. For a large part of the research, households that donated less than 2% of the income were considered as “giving less” whereas the above average donors were considered as “giving more”. This, to me, is a far better metric than any absolute figures. 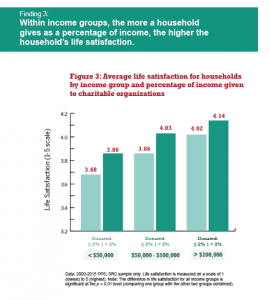 For this finding too, the research found that the group donating more than 2% of their annual income showed a significantly higher level of life satisfaction than those donating less than 2% of their annual income. This finding was consistent across all 3 annual household income groups that they checked for – less than $50,000, between $50,000 and $100,000 and more than $100,000. This conclusion is arrived at through two of the findings – one, single men experienced a significant enhancement in their reported life satisfaction between being a donor and non-donor. 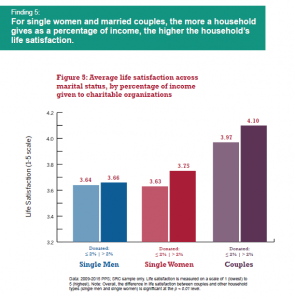 On the other hand, single women and couples reported a significant difference in life satisfaction between less than or more than 2% annual household income donated. So, for men, just the act of giving gave them a higher satisfaction whereas for women the level of satisfaction was higher with a higher quantum of giving. This finding also played out with respect to couples and their giving. For a household, the involvement of the wife in giving decisions meant that the couple experienced higher satisfaction with a higher level of giving. To me, this research boils down to some simple conclusions. Do you want to be more satisfied in life? Start donating. If you are a man, this simple act will make a huge difference in your satisfaction levels. If you are a woman, keep making efforts to increase your giving and watch your satisfaction increase with it. We always gave 10-12% of gross income away our whole careers. We still do that for the side gig income now we are early retired. On paper it has cost us millions, in our hearts it has made us rich. Really sorry for the late response. I think with giving 10-12% of your income to charity, you are a real inspiration. I am hoping to make it a habit and increase my giving every year, instead of ad-hoc donations.